The audience looks over examples of other police and fire stations. 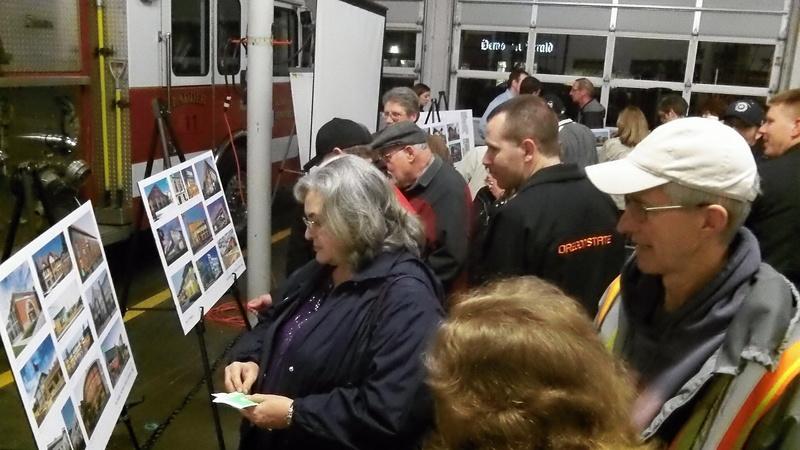 Albany’s effort to replace its police headquarters and main fire station downtown took another step Tuesday with a public listening session on how people would like the buildings to look. The Portland-based design firm Mackenzie gave an audience of about 60 or so lots of examples of police and fire stations from around the world in dozens of different styles and asked them to indicate — with colored dots — what they did or didn’t like. Flashy buildings with lots of exterior glass were frowned upon, it turned out. Buildings that fit inn with the styles of the neighborhood, both near the historic downtown and near the police site on Pacific Boulevard, were preferred. Steep gables and elaborate ornamentation were out. But exteriors the community could be proud of were in. No surprises there, but the designers said they would keep the comments in mind when working on the exteriors. For this so-called “visioning” session, the audience sat in folding chairs in the apparatus bays of downtown Fire Station 11. (One engine, parked outside, took off for an alarm during the two-hour meeting.) The session capped public tours of the fire hall and the police station on three successive Tuesdays. The Mackenzie representatives went through a litany of reasons why both buildings should be replaced. The fire hall was built in 1949 and the police station in 1988. Both have long lists of structural and functional faults, not to mention being too small and cramped and out of compliance with current codes. Neither meets standards for essential buildings. Both could be upgraded, but they would still be too small and the cost of upgrades would be 86 percent of new and expanded buildings in case of Station 11 and 89 percent for the police. The designers — John Pete, Jeff Rhys Humphreys, and Caitlin Pierce Cranley — made a point of saying they had been able to refine the preliminary floor plans to make them more efficient. Capt. 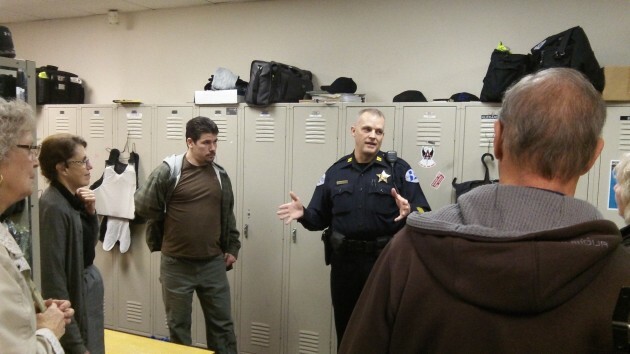 Jeff Hinrichs shows a tour group the police station locker room Tuesday. If construction plans on a public project go as normal the cost will be at least 2 times projected, and probably 3 times projected. $36 to $54 million would be the realistic estimate. $18 million? – Ha!